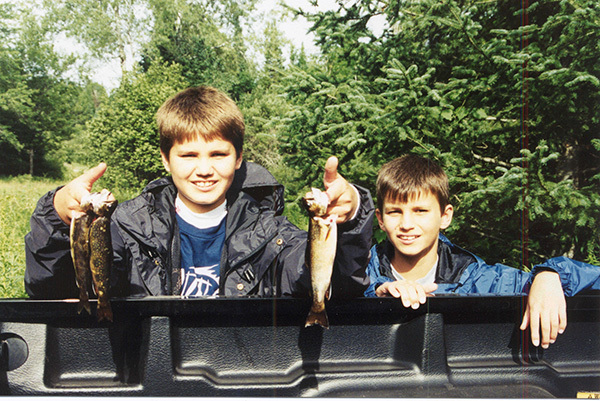 James and Jeff Pepin with some of the brook trout they caught from a stream in Houghton County. Being a divorced parent with children involved is tough for anyone. Those circumstances are made more difficult when parents and children live a long distance away from each other. In my case, I was living out west when I got divorced. I moved back to the Upper Peninsula, where I was born and raised, leaving my two young boys 2,283 miles away in southern California. According to online mapping information, it’s a drive via I-80 or I-70 with traffic, of 40 hours and 16 minutes each way. It would be years before I fully realized the mistake I made. I had failed to consider the impact that distance, coupled with time, would have on our relationship and the challenges we would face apart. For them, it was hard to understand a dad who would leave and go so far away, missing out on all their activities, events and changes. We had been a team, sharing lots of laughs, playing football on our knees in the house, fixing stuff, going to the park. For me, it was hard to see these guys only in the summertime—missing all those same changes, events and activities—watching me fade from importance in their eyes as someone they were losing real familiarity with the older we all got. At the same time, I was home and closer to my dad, who had been ill. To me, there were no easy answers to any of this. No matter the situation, one thing I was always hoping to do was cement a connection between my boys and myself and the natural world outdoors. Before I left California, there had been at least a couple camping trips with my oldest son, James, who wasn’t very old at the time. I took him with me on an overnight outing surveying spotted owls for the U.S. Forest Service in the San Gabriel Mountains. It was his first time camping out, and we set up our tent on a hill high above the graveled canyon floor. We saw hummingbirds buzzing between the flowering plants, and a northern pygmy owl came to visit after we whistled him into sight. That night, we heard a mountain lion down in the canyon. On another outing, my youngest son, Jeff and his mom were along with James and me when we all camped at Sulphur Springs, a spot tucked into the mountains above Los Angeles, where a trickle of water attracted a nice variety of birds and other wildlife. I also liked to take the boys for nighttime rides out into the Mojave Desert near the Devil’s Punchbowl. I used to let them sit on my lap and steer my pick-up truck out under the stars on those dark, black-topped roads. Back here in Michigan, on one of their summer trips home, I took the boys to Houghton County, where we spent a few days in a cabin, taking day trips fishing for brook trout, checking out waterfalls, rocky rivers, deep woodlands and mosquito-clouded back roads. They slept in bunk beds. We cooked on a grill outside the cabin door. The old deer camp-styled cabin was comfortable, with soft mattresses and thick blankets that held the damp nighttime air at bay. I taught them how to tie a hook on their line, bait a hook and read a river to find fish, and they watched me clean and cook the trout. A few years later, the boys had again returned for an annual summer visit. By now, they had learned a thing or two about how to fend for themselves. But while they had learned some things, I found out that others were still beyond their reach. One day while I had gone to work, they planned to watch television and relax much of the afternoon, cooking hot dogs and macaroni and cheese for lunch – typical kid stuff. When I got home from work, I asked how lunch was. They said they could only eat the macaroni and cheese, having to go without hot dogs because an electrical breaker had tripped, leaving them without the microwave. “Why didn’t you boil the hot dogs in a pan on the stove?” I asked. “You can do that?” they asked, incredulous. I thought they were kidding. I didn’t know whether to laugh or to cry. I think, in that one brief instant, that I realized on some level I had failed them. This was perhaps one of the first indications for me that there was a whole network of cracked and unseen fault lines underlying the framework of our trying to make the best of this long-distance parent-child relationship. This time, there was more indifference and less understanding between us. The awkwardness was palpable. There was tension I didn’t understand. We had continued to grow further apart. But none of that stopped us from enjoying ourselves at the cabin and hitting the streams for a couple of days. As I drove, Jeff was in the front seat navigating, looking at a map. At his direction, we stopped along a green, grassy meadow off the highway, where a small stream snaked its way into the woods, near an old concrete bridge that had fallen into disrepair. Within a few casts of our spinners, we had a few nice fish. We repeated this process as we checked out the countryside, exploring new waters. At a shallow, log-bottomed pond, with darkness on its way, James caught the biggest trout of the day. Back at the cabin, the boys helped clean the fish. This time, I would show them how to cook up the trout in a frying pan on the stove, and they would learn by doing. They helped wash and flour the trout. “Just so you know, we’re going to be using real butter to fry these fish in—none of that low-fat crap,” I said, smiling. I gave them the finer points—watching the color of the fish turn from opaque gray to white to know when the trout were cooked all the way through. I reminded them how to lift the spine to pull the rib cage and the rest of the bones out, flaking the fish off the bones onto the plate. I also reminded them to eat the crunchy, butter-fried fish tails and to leave the skin on for some of the best taste. Since James had caught the biggest fish, he was the first to try the fish. Jeff and I watched silently in anticipation. “That is so good,” he said. That’s all we needed to hear. We picked up our forks. This trip back to the cabin would also be memorable for us, but not in the same way the first trip had been. This time, it was more of a benchmark delineating how far we had drifted apart—but along with the fault lines we found, I know now there remained an enduring love and memories of the closeness we had shared way back before the divorce, before I had moved away. I was pleased to hear the boys had been taking their own fishing and camping trips out west. It took a half-dozen more years—more valuable time lost—before we were able to finally meet in the desert out west to settle our differences, men to man. I had been asking them to grant me more access to their lives and their time. Clearly, they didn’t have to agree. They had grown beyond me long ago. On my end, the older I got, the more I needed them, the less I saw them. I explained how, as the years go by, time gives you perspective and wisdom to see your faults. I could only offer my truth and my love. On a January afternoon, my plane circled and landed in Albuquerque. We headed south along I-25 toward the Rio Grande. We passed numerous roadside memorials and beautiful, small desert cemeteries. 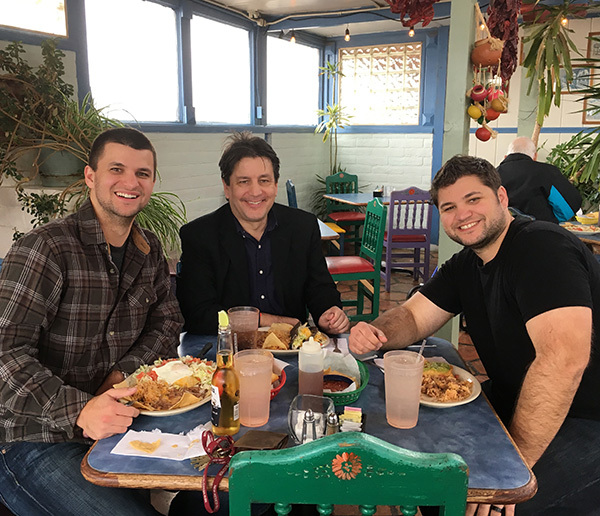 Jeff, John and James Pepin out for a southwestern-style meal together in New Mexico. We enjoyed the hot springs of Truth or Consequences, had some great local food and experienced the amazing Blue Oyster Cult in concert. At New Mexico Tech, I shot some hoops with the boys, toured the campus and was surprised to find samples of almandine and chamosite from Michigamme, and Kona dolomite from Marquette in a display case at the school mineral museum. We later sat in my little motel room there in Socorro. I had said I wanted to talk with them. After we heard each other out, we agreed to work together to reconstruct our lives together as much as we could—going forward. I have visited both of their homes. I am so proud of them and the men they have become. I’ve been introduced to my beautiful granddaughter Evelyn, who was just born this past autumn. I met her lovely mother in person too, and her parents. I had missed the wedding—another time I had tried to do what I thought was best, but realized later, it was a time when my pride and insecurity tripped me on my face. Last week, I talked with the boys for over an hour on a video chat. I got to see Evelyn eat her peas. We talk over the computer regularly now. We have plans to reconnect in Michigan sometime soon. With the trout season opening Saturday, it wouldn’t surprise me if we soon found our way back to the red-and-white cabin still sitting under the pine trees, just up the trail from where the river gets wider. We could fish again together, walk those old dirt roads, talk about the good times way back when or just sit on the front porch of the cabin, watching the sun go down over the trees, waiting for the stars to come up. Whatever we do, I know I’ll be happy to be there. Want to take someone special fishing? 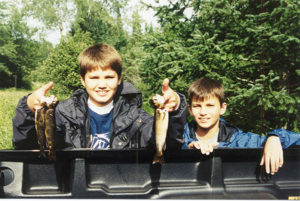 Get more information on fishing in Michigan, including seasons, tactics, fish identification and more, at www.mi.gov/fishing.